A c1805 New Hall Porcelain, Silver Shape Hand PaintedTeapot. 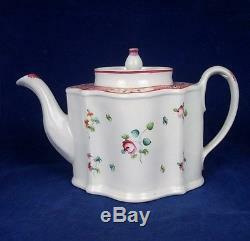 A New Hall porcelain teapot in the famille rose palette, having a hatched pink border, black leaves and red roses in white reserves to shoulder and cover. The body is painted with rose springs. In the late eighteenth century New Hall made ceramic history as the first pottery in Staffordshire to manufacture porcelain successfully. A previous attempt at Longton Hall had ended in failure in 1760. The teapot is 6 inches (15cm) in height by 9 inches (23cm) long by 5 inches (15cm) wide. Condition The teapot has some cracks/restoration to the handle and the lid. For further detail and condition, please see images below. The item "A New Hall c1805 Porcelain Silver Shape Hand Painted Teapot" is in sale since Sunday, December 11, 2011. This item is in the category "Pottery, Porcelain & Glass\Date-Lined Ceramics\Pre-c. The seller is "theantiquesstorehouse" and is located in Portsmouth.